In last week’s post, we gave the example of anchoring to market highs as a poor way of determining when to sell. Our investments grow precisely because they consistently see new highs; not because we sell when they get there. The chart below shows just how common it is to see new market highs. 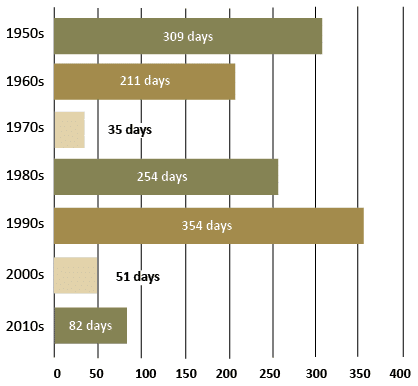 This chart’s twin, showing new all-time low stock market values, has only one very short bar in the 1950s. It turns out that it is easy to invest for the long-term and difficult to invest for the short-term. Hopefully this chart makes it a little easier to stay long-term focused. Data represents past performance. Past performance is no guarantee of future results. Chart is for illustrative purposes only. Returns are based on data from the S&P 500 PR from 1950-1987 and the S&P 500 TR from 1988-2013.